First up was the whole shoulder. I like it hickory smoked, so off to the woods we go to find some fallen hickory. Early the next morning when it was still dark, I got the charcoal going. Boone left to go hunting and must have agitated the coyotes in the woods because in the area he went into, 2 different packs started sounding off. It was eerie and surreal standing out in the dark by the smoker listening to them. As the charcoal was getting hot, I dropped the chunks of hickory into a bucket of water to soak. The shoulder was so big it would not fit on the smoker so Boone had to hack it into 2 pieces. I do not do anything other than wash and pat dry the shoulder. No salt, pepper, nothing. The USDA says pork is done internally at minimum temp of 145F. It will pull off the bone easily around an internal temp of 200F. so I do stick a meat thermometer into it to be sure of when it’s done. When the charcoal is ready – into the firebox it goes with some of the wet hickory on top, then the smoker body – fill the water bowl with water, then lastly the grate with the 2 pieces of shoulder. 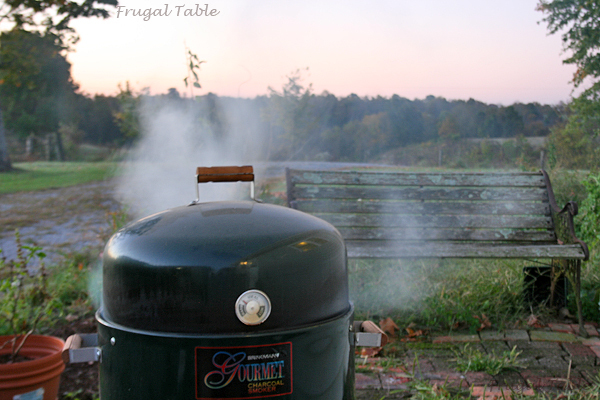 Lid on and we are smoking our way towards some great barbecue. Mix all ingredients, bottle and let steep for at least half a day before using. Steeping overnight or longer is preferred for the best flavor. Strain if preferred before using. I keep an empty cider bottle around just for sauce making time so all I have to do is pour the ingredients in it, shake it once a day and let it steep for a week or so before using. A lot of folks don’t but I like to strain the sauce before using it. The peppers will give the meat heat if you leave it in but we like ours to come mostly from the Texas Pete that we put on the barbecue sandwiches. Smoking takes a while so I do it on the weekend when I am home all day and can check the smoker every couple of hours, adding water or more hickory as needed. I think I added more charcoal at least 3 or 4 times. Around the 6 hour mark the internal temp was up to 170 so I decided to go ahead and pull the shoulder off, wrap it up in aluminum foil (I took the thermometer out and reinserted after I wrapped them) and slid it into the oven (350F) to finish it off to 200F. When it was ready, I let it sit until cool enough to handle. It shredded beautifully and since we like chopped barbecue I chopped everything up. I also include bits of minced skin in the barbecue for added flavor. Since we were planning on having barbecue for dinner I went ahead and put some aside and added the sauce to it. The sauce is really thin but when you reheat the meat with the sauce a lot of the liquid will be absorbed. Since we are splitting the pork with our son, I packaged the rest in ½ lb. freezer bags without the sauce and froze. This way, the smoked pork can be used in different recipes besides just barbecue. 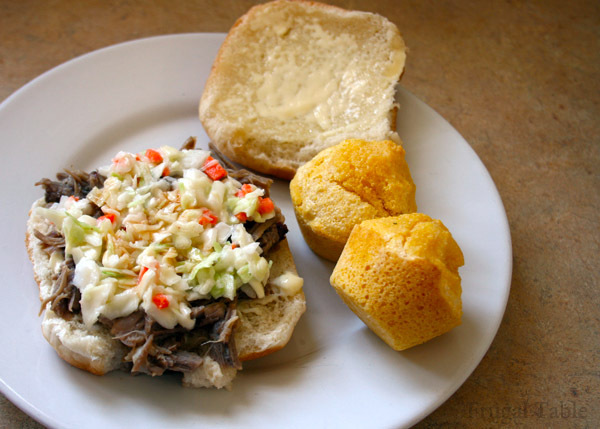 The perfect barbecue sandwich for us starts with a warm bun with just a slide of mayonnaise, then barbecue, coleslaw and topped with a bit of Texas Pete. Heaven!